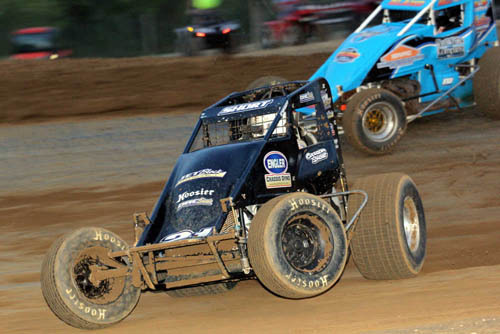 PUTNAMVILLE – Carson Short picked up a victory in the Hoosier Tire Midwest Sprint Car Series at Lincoln Park Speedway Saturday evening. The Illinois driver ran fifth at Bloomington Speedway the night before as the holiday weekend got started with the Josh Burton Memorial event on the red clay. Short started on the outside of the front row after claiming fast qualifier honors and running second in his heat race. Jeff Bland Jr., Stevie Sussex, Kyle Cummins and Shane Cockrum were each winners of their respective heat races to start the evening. Bland jumped to the early lead as Jon Stanbrough, Cummins and Koby Barksdale were tightly bunched behind them with Robert Balou and Josh Hodges in tow. However, Short was stalking the lead spot through 10 laps, but Bland managed to hold onto the point through 11 circuits. It was the 12th lap, which made all the difference for Short, who dove to the bottom line and slid underneath Bland coming through turn one to take the top spot. Once Short was out front he began to build on his lead as Bland was charged with holding off Cummins with Stanbrough several car lengths back in fourth position. Short had opened up a five car length lead by lap 16 as Bland stretched out his advantage on the third-place car, Cummins. With five laps remaining Short got into lapped traffic, but worked them to perfection to maintain his lead over the final circuits. Bland and Stanbrough wrapped up the podium finishers as Ballou and Dave Darland worked their way into the top-five. The last seven days there have been plenty of things to celebrate for Jordan Wever as the teenager captured the UMP Modified main event on May 19 at LPS. He trumped that by graduating from Bloomington South High School over the weekend and then the icing on the cake was a repeat victory at the Putnamville oval on Saturday night. Wever took over the lead from Randy Shuman on lap five and then a lap six restart was the last thing to slow him down. Wever ran a flawless race out front to stay out front of Shuman, who started from the pole spot. A lap nine spin by Carlos Bumgardner caught Derek Groomer and Travis Shoulders. On the restart, Wever got a good jump to keep Shuman at bay as the laps ticked off. James Walters closed on Shuman down the stretch as Groomer roared back through the field and found himself running fourth down the stretch. Wever kept a stranglehold on the lead over the final few laps to take his second win as Shuman, Walters, Rob Brickert and Groomer rounded out the top-five. In the UMP Super Stock division, a strong start to the season continues for Wes McClara as he claimed the third win of the year at LPS. McClara started fifth as Jonny Newgent led the first few laps before a broken ball joint sent him back to the pits. Last week’s winner, Bryce Shidler, took over the top spot before McClara blasted to the lead at the halfway point. McClara made the pass for the lead heading into turn four and wouldn’t look back. Doug McCullough ran the high side in third with a gap developing ahead of a door-to-door battle between Larry Knight and Paul Wright. Up front, McClara pulled away from the field as McCullough got past Shidler over the final few laps to take down the runner-up spot. Raines moved into third at the finish line ahead of Shidler and Wright. In the bomber feature Cody Wright returned to victory lane as he started from the pole and bested the competition by building a straightaway lead by lap 10. Behind him it was Jeff Beggs battling with Justin Litton as Tom Cox and Corey Anstead ran for fifth. Gary Hayden and Jordan Almanza ran wheel-to-wheel behind them in a tight formation. Wright managed lapped traffic over the final few laps to take the checkered flag ahead of Beggs, Litton, Almanza and Cox. In the second bomber feature it was Frank Horvath holding off a late challenge from Keivan Clodfelter over the final two laps to gain the win.